Controlling and monitoring the activities of defined cell populations should provide powerful methodologies for better understanding individual cellular functions in vivo. To enable the control and monitoring of cellular activities, ‘photo-actuator molecules’ and ‘fluorescent probe molecules’ have been generated, respectively. Photo-actuators are the motor molecules that can trigger cellular activities by photo-activation of specific intracellular molecules, and fluorescent probes are the molecules utilized to detect cellular activities by emitting fluorescence upon binding to their specific target structures of intracellular molecules. These actuators and probes are also known as ‘optogenetic tools’, and they can be expressed in specific cells or specific organelles for a long period, because they are genetically encoded. 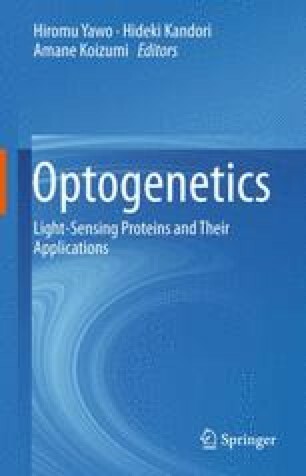 In recent years, the development and improvement of optogenetic tools has progressed rapidly. Researchers can now choose optogenetic tools that better suit their needs. In this review, we describe the history, species, and development of optogenetic tools, and future issues, limiting the definition of optogenetic tools to those based on proteins.